Here's another great way to use one of those rotisserie chickens sold at the deli in your favorite grocery. 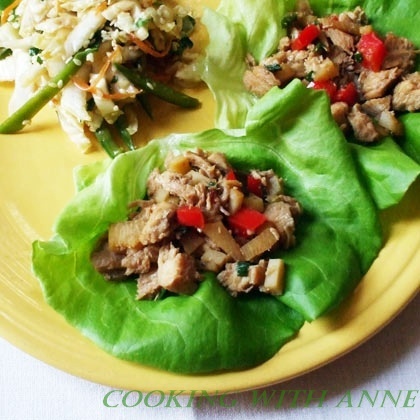 I love lettuce wraps - they're like egg rolls without all the extra fat and calories. I'm lucky enough to have kids that will eat lettuce, among lots of other veggies, so these are great for us. I like using the rotisserie chicken since it's already cooked and more tender than other pre-cooked chicken products. It's also pretty straight-forward without extra preservatives and junk added. The sesame slaw is fast and full of flavor and pairs perfectly with the lettuce wraps. Having similar ingredients in both recipes speeds prep-time, as well. 1. Remove meat only from rotisserie chicken and dice small. This should give you about 2 cups of diced chicken. 2. Toss chicken with remaining ingredients. 3. Cook until heated through - about 5 minutes. 4. Serve with lettuce leaves for wrapping. Notes: A plain rotisserie chicken works fine for this. We used Boston lettuce for our wraps, although any lettuce will do. I also like the crunch of romaine lettuce. Smaller lettuce leaves yield more wraps. 1. Toss together cabbage, carrot, snow peas and cilantro. 2. Mix dressing ingredients well and pour over cabbage. 4. Refrigerate for at least half an hour before serving. Here in the Lehigh Valley, we don't live too far from Amish communities. It's no surprise, then, that I have several Amish cookbooks. Most are the same - recipes written with no fluff or extras, and no photographs. Amish food isn't exceptionally pretty, but the flavor more than makes up for it. 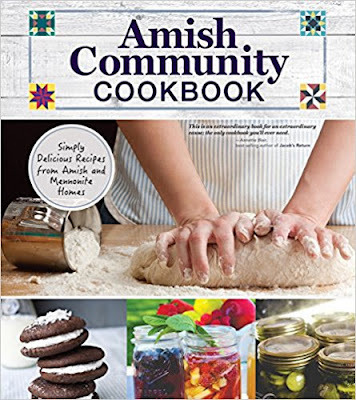 This cookbook, Amish Community Cookbook (Fox Chapel Publishing, 2017), authored by Carole Roth Giagnocavo and the Mennonite Central Committee, with photos from bloggers Joel Kratzer and Kaleb Wyse, fills in the photography gap in a beautiful way. Most of the recipes are familiar to me, as they would be in Amish cooking, but the photos and anecdotes are what help propel this book above and beyond the rest. Oh, I still love my other cookbooks, but in my house there is always room for more - especially of the Amish variety. The book begins with a brief introduction and history of Amish and Mennonites and goes on to offer little details about Amish cooking that are essential to know - things like using potato water and what "salad dressing" refers to throughout the book. While I fully enjoyed the anecdotes about Amish and Mennonite life, the thing I missed the most were descriptions of different recipes and how they had come to be. Mostly these are things I already know, but the average home cook may not. The recipes are divine, and that's really the point, In fact, I've made Zucchini Casserole 3 times in the past two weeks! That stuff is just perfect and even my pickiest kids love it. Every recipe is comfort food at its finest - the kind that sustains a farmer for hours on end and nourishes the body and the soul. This is light and fluffy and SO delicious! It's the perfect complement to any meat dish and my vegetarian daughter loves this as-is! Mix all ingredients together and put in 7x12 inch baking pan. Bake at 350 F for 30-35 minutes or until a knife comes out clean when inserted in the center. My notes: The onion is chopped finely, the Parmesan is grated, and I have used different cheeses in place of the Swiss with no ill effects. If you adore Amish and Mennonite food like we do, pick up a copy of this book and you won't be disappointed!